reputation for consistent innovation at the highest level of design and customer service. With a design/build firm like Progressive, you don’t have to worry about working with multiple companies. We assign one project manager to coordinate every aspect of your project – from conception to creation. More importantly, your project manager is completely accountable for 100% customer satisfaction. How’s that for peace of mind? Make better, more informed decisions right from the start, working with a design/build team that has a detailed understanding of your remodeling costs upfront. First, we work with you to develop a design that captures your vision, suits your tastes, and fits your budget. Then we create a design-based estimate that’s both accurate and informative — so you know exactly what you’re paying for. With Progressive Design Build’s project tracking system, we keep you in-the-know. Our personal web portal tracks daily activity, shares progress photos, streamlines warranty requests, and holds subcontractors accountable to their tasks. We make sure you’re never surprised by change orders or delays – in fact, you’ll never miss a thing. Progressive Design Build’s team of contractors and designers understand that your home remodel isn’t just important – it’s personal. We go the extra mile to create a living space fit for a lifetime of enjoyment. Progressive Design Build makes the remodeling process smooth and enjoyable. We’ll walk you through our simple 3-step process starting from in-take and design exploration to budgeting and construction. We coordinate and manage your entire project from start to finish – it’s as easy as 1-2-3! Find an error or defect? You will never pay for a mistake traced back to our workmanship. All our remodeling projects are backed by a 3-year warranty. After that, we offer complimentary annual inspections for your convenience and peace of mind. It’s not just what you see. It’s how you feel. We’re here for you – from start to finish. 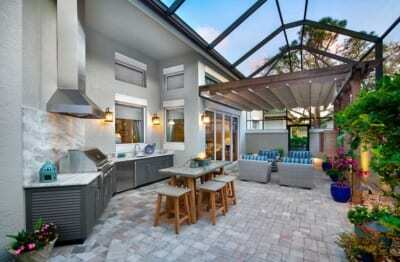 We are serious about creating an exemplary remodeling experience for homeowners in Southwest Florida. To help us ensure the best customer experience, we’ve hired GuildQuality – an unbiased, third-party customer survey company – to perform mid and post-project reviews. After 28 years in business, we’ll be the first to admit that every remodeling project has its challenges. But it’s not the complexity of projects that sets us apart, it’s how we handle them. At Progressive Design Build, we appreciate your honesty about what it’s like to work with us. We take great pride in what we do. And your participation in GuildQuality reviews only helps us do it better. By sharing survey results, client testimonials, online reviews, and other customer feedback, we hope to demonstrate our continued commitment to transparency and excellence.